The number of products and services available over the Internet increases dramatically during the last years and it is already beyond the human ability to analyze and combine them efficiently. At the same time if we consider works in software engineering (and, in particular, in component-based system development) then we can find quite strong similarity in problem description. The web services can be treated in a way similar to software components and service composition can be considered as problem of software synthesis and composition. Basic idea of our approach is applying the software synthesis and composition methods to value added web services composition. We also describe some technical details within the approach, in particular, a web service description language and a program synthesis method. DAML-S Coalition. Daml-s 0.6 draft release. http://www.daml.org/services/daml-s/2001/10/, december 2001. UDDI.org. Universal description, discovery and integration specification. http://www.uddi.org/specification.html. W3C.org. 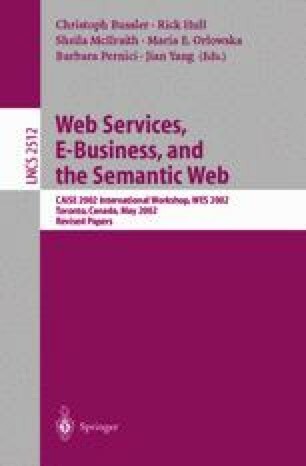 Web services description language (wsdl) 1.1. http://www.w3.org/TR/wsdl.